Special Extra Strength Formula For Tough Jobs. Increase Accuracy By: Totally removing copper or gilded metal fouling in firearm bores, put there by jacketed ammunition. Copper Remover Advantages include: Faster acting, Better value (compare with the competition), Restores accuracy in old or neglected firearms and Easy to use. * * Sale Price: $9.50 each While Supply Lasts $14.00 ea. 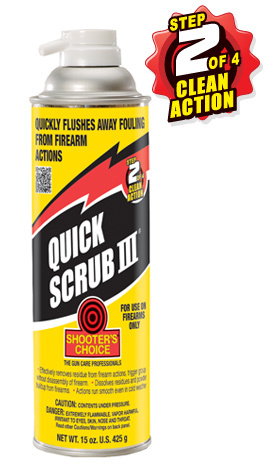 Shooter’s Choice Quick Scrub III removes fouling for trouble-free actions and precision trigger pulls, without disassembling the firearm. 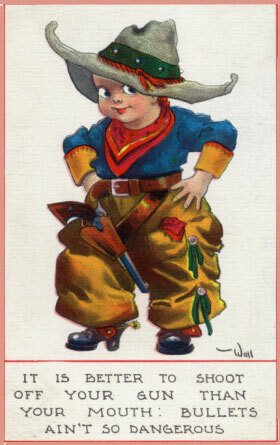 Recommended for all conventional firearms and Black powder firearms. Removes residue from firearm actions, trigger group without the disassembly of firearm. Dissolves residues and powder buildup from firearms. Actions run smooth even in cold weather. 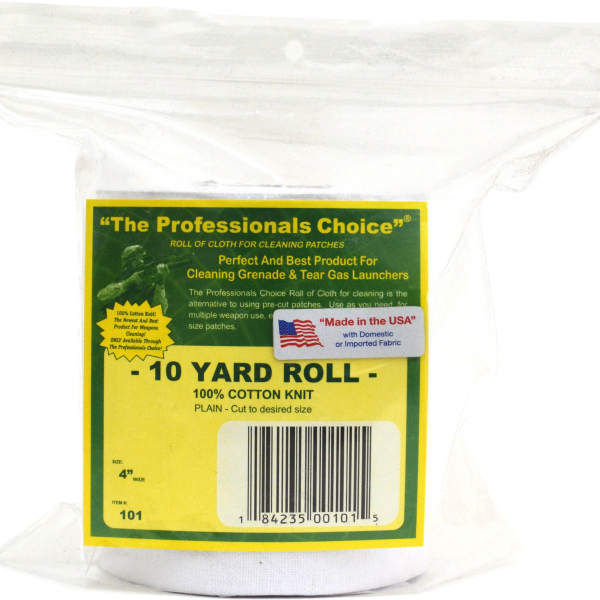 Product Features & Advantages: Extra Pressure with precision valving, Firearm disassembly not required, Actions perform smoother (even in cold weather), Evaporates quickly and Leaves no residue. Quick Scrub lll - 15 oz. Aerosol Can with Extension Tube $14.00 ea. Temperature Operating Range: -45° F to +500° F.
Increases Total Performance By: Reducing friction and wear, Protecting against metal damage, and Eliminating most malfunctions. Recommended Uses Include: Firearms, Fishing Tackle, Marine, Sports Equipment, Auto, Industrial, Shop and Household. Engineered to Meet the Most Demanding Needs for Firearm Lubrication and Protection! 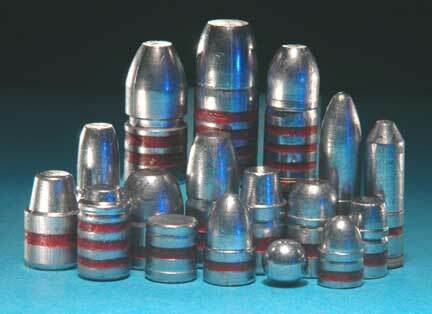 Great for Nickel, Stainless, and Chrome Moly! Also good for childrens toys and exercise equipment! Prevents Metal Damage In The Following Gun Areas: Actions, Frame rails, Shotgun hinges and hardware, Bolt-action locking lugs. High-Tech Grease Advantages Include: Quick and easy to apply, Odorless (for the hunter), Clings to metal surfaces, Doesn't fly off full autos, Doesn't gum-up, Doesn't wash off with water, Doesn't melt when hot and Doesn't stiffen when cold. Recommended Uses: Firearms, Fishing Tackle, Marine, Sports Equipment, Compound Bows, Auto, Industrial, Shop and Household. A Superior Anti-Oxidation Moisture Displacing Agent Engineered to Preserve All Gun Metals. Protects Guns Against: Rust, Pitting, Corrosion, Salt Air, Fingerprints and Body Acids. Advantages Include: Displaces water, Penetrates, Ultra Thin Film, Non-Conductive and Prevents Electrolysis. Recommended Uses: Rifles, Shotguns, Handguns, All black powder muzzle loaders and in-line firearms. 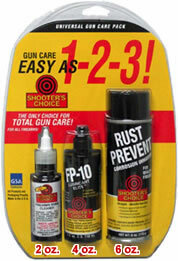 A complete kit of Shooters Choice Gun Care products to Clean, Lubricate and Protect. This new all in one pack is the total gun care answer for all firearms! 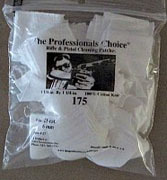 Shooters Choice Firearms Bore Cleaner 2 oz resin bottle with applicator spout. Safe-Quick-Easy... Conditions bore for impact accuracy on first shot, Seasons bore to resist fouling build-up, Non-Abrasive-harmless to the bore surface, Maintains accuracy in new firearms, Restores accuracy in old firearms and Prolongs Barrel Life. 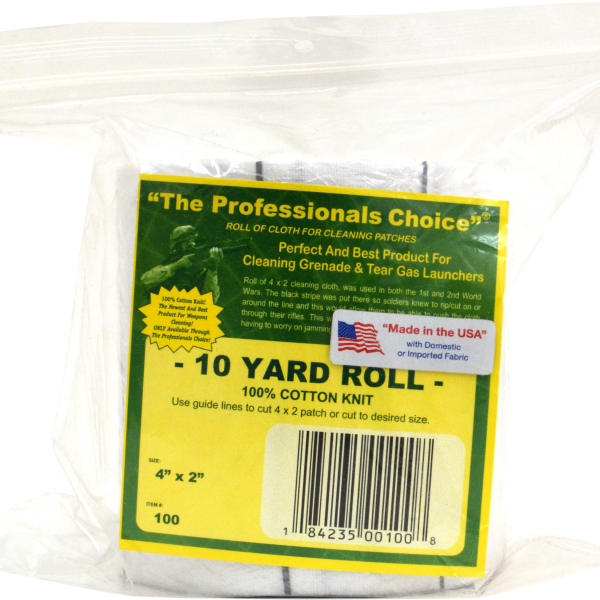 Removes all types of fouling, powder,carbon,lead, copper, plastic shotgun wads. FP-10 Lubricant Elite in a 4oz container with applicator spout. Dramatically increases lubricity between moving parts with no build up or tolerance changes. Out performs Teflon based products, Reduces friction and wear, Protects against metal damage, Eliminates most malfunctions, Use on firearms, auto, fishing tackle, Household, marine, shop, sports equipment. Rust Preventative/Lubricant in 6oz aerosol container - Superior anti oxidant that displaces moisture and engineered to preserve all firearms metals. Protects against rust, corrosion, fingerprints and body acids, pitting, and salt air. Penetrates, non corrosive, lubricates, ultra thin film, prevents electrolysis. Use for, firearms, auto, fishing tackle, Sports equipment, shop, Marine, Industrial.